← Still time to register for the ILT2014 Conference | Only one week to go! One of my favourite things to do in this role is to check out new technology. This week I received the Inclusive EyeGaze Foundations which included the myGaze eye tracker and the Inclusive Attention and Looking software. I’m a bit of a tech geek by nature so trying them out was right up my alley! The first thing I did when I opened the box was look at the handy step by step list provided in the one page quick start guide. I downloaded the appropriate myGaze software and installed it on the computer. Next, I positioned the myGaze Eye Tracker at the base of the monitor which needs to be between 10″ and 22″. You can also use the Eye Tracker on a laptop which I also tried. There are attachments for monitor or laptop and the Eye Tracker clicks into place easily. If you’re not sure how to mount it there is a video guide you can watch also. Make sure the Eye Tracker is centered, plug the USB in and you’re ready to go. There are two pieces of software that you need to install but you only need to open myGaze EyeMouse Play for initial set up. 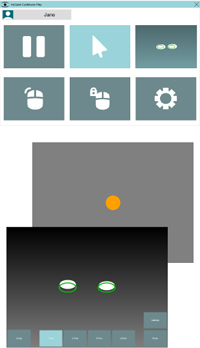 EyeMouse Play is a fantastic simplified menu for all ages and abilities. The first thing you will see is a set of eye glasses on the screen and then your own eyes that you need to match up to it for correct positioning. Then you can calibrate your eyes using 1, 2, 5 or 9 points. If multiple people will use the Eye Tracker then add them in and name them as you do each calibration. Finally, choose the cursor function and dwell settings that suit you best and you can start eye gazing! Using the myGaze Eye Tracker, your eye movements are followed around the screen and you move the cursor. You can select or ‘click’ on images by looking at them a little longer. Timing and adjustments are done in the EyeMouse Play software. There is a nice little indicator in the system tray of your computer that goes red whenever your eyes have moved out of position. So you can quickly open your EyeMouse Play software at any point to readjust if you need to. Lots of your favourite games and software can be accessed using the myGaze Eye Tracker. I was able to write in a Clicker 6 document, play the popular HelpKidzLearn Pop the Bubbles game and update my Facebook status using the Windows onscreen keyboard. All in a day’s work Many programs such as ChooseIt! Maker 3, Sensory Eye-FX, Look to Learn, The Grid 2, Boardmaker Plus + Studio and lots of others are also compatible. This short video gives you a great introduction to how it all works. There are also some fabulous eye gaze software training packages. The three packages are: Attention and Looking, Exploring and Playing (available July 2014) and Choosing and Learning (available September 2014). Attention and Looking came in the bundle I received. Each package has 18 activities addressing different skill areas. 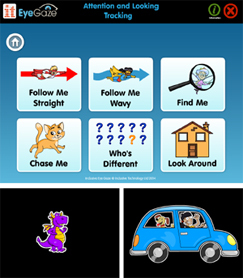 The Attention and Looking package looks at assessing and teaching attention and looking skills, simple access skills and understanding of eye gaze. All packages work through a progression with fun characters and sounds which can be customised in the settings to suit each individual. You can also gain feedback and analyse the eye tracking of an individual with a video playback, heat mapping and line tracing of eye gaze movements. I am always amazed and excited by eye gaze technology. It’s something that can change the life of an individual with physical disabilities so that they can access the technology world and beyond. I wonder what will come next?